Autumn is in full swing and the need for warming comforting meals in definitely needed! With it begin Halloween I thought this recipe would be perfect. It is based on the curry I had at Cafe Eighty2 the night before my wedding. I couldn’t believe it when I realised that I haven’t made a curry since we moved into our house. It is more of a red thai curry base, but not exactly! It is vegan and gluten free which is always brilliant and still incredibly warming and filling. Having the smoked tofu in this adds a wonderful flavour to the dish and I find I use chickpeas every time I make a curry so made a great change to the source of protein. 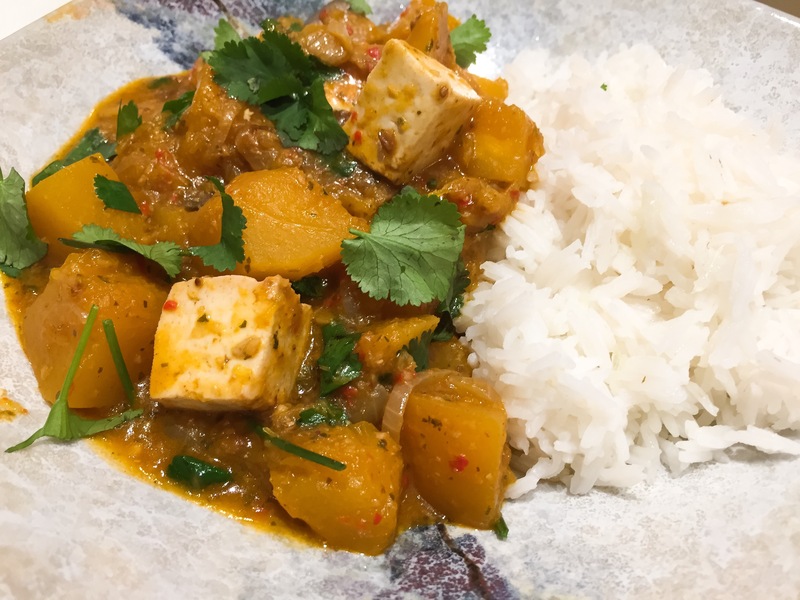 The curry paste is very easy to make, using a small blender makes it much faster than using a pestle and mortar as it has a lot of wet ingredients in it. To make the curry paste, toast the coriander seeds in a dry frying pan for a couple of minutes. Place in a pestle and mortar and grind until fine. Place the coriander in a small food processor with the garlic, ginger, lemongrass, tamarind, lime zest, fresh coriander, coconut oil, tomato puree and chillies. Blitz until smooth. Finely slice the onion and place it in a pan with 1 tbsp of coconut oil. Cook on a medium heat until cooked and starting to turn brown and crispy on the edges. Add in the curry paste and cook for a further five minutes. Add the aubergine, pumpkin and coconut oil. Simmer gently until the pumpkin is soft. Once the pumpkin has cooked add the smoked tofu and leave to simmer. Place the rice in a pan of simmering water and cook according to packet instructions (normally 12 minutes). To serve place the rice in your bowl. Mix another handful of fresh coriander into the curry, season to taste, then place in the bowl.